WEB HOSTED iPhone, Android, BlackBerry smart phone web punch application. Know where they are, get email alerts, and more. Read more about it below. Downloadable from the Apple App Store to your "Smart Phone"
1) Select this item and register online. If you are not using a smartphone, call us and we will set up your land line connection. GPS enabled! Shows the current GPS coordinates when the employee signs IN and OUT. You will know where they are. Your phone must be GPS capable for the GPS coordinates to work. Land-Line enabled! The telephone number would be on the “Safe“ list, other numbers do not work, just that particular number at that location. Everyone can use the same iPhone, or any iPhone that has the app on it! Job Codes: If you need this, it's built-in: An employee can scroll through and select a preset job code, which the Administrator sets up in the software. 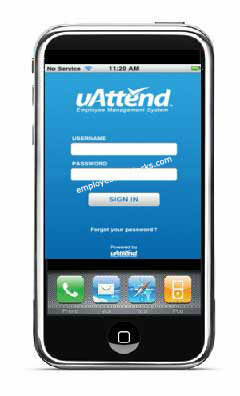 The mobile application is one of the many methods that employees can use to clock in and out of the system. The updated uAttend mobile app is currently available for Android users. uAttend's iPhone and iPad app will also soon be updated. It can also work with the GPS feature on a smart phone, and show you where the employee is, when signing in, and out. New features make this application a convenient tool for administrators and supervisors to manage the system on their handheld device, without needing access to a computer. They can now edit time cards, approve time cards, and run department summaries for payroll using the mobile app. Supervisors can punch in an entire group of employees, all at once, on their tablet or smart-phone. Administrators and supervisors can also view the Who’s In Board, which provides convenient employee tracking by showing the current status (IN or OUT) of each employee, by department. Supervisors can also now perform a “group punch” so that they can punch in multiple employees in their department at one time. 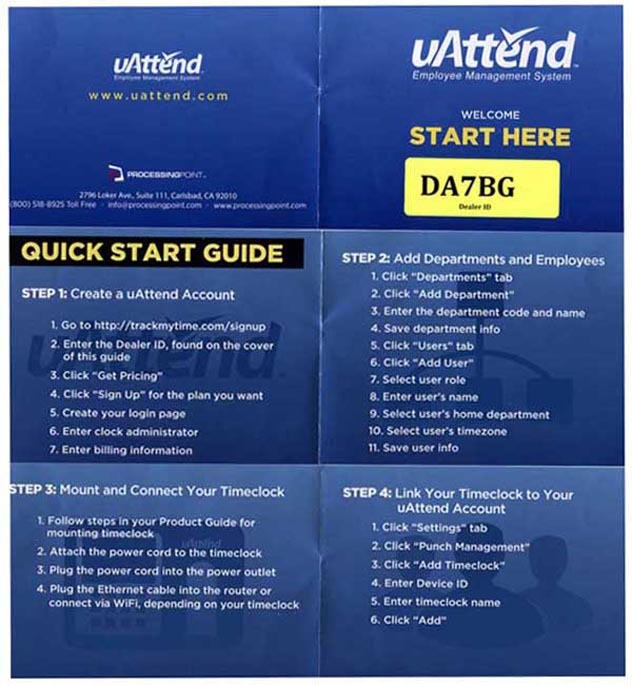 This saves employees time and eliminates the need for each employee to access the system individually. Employees can view their timecards when they punch in and out and may also be able to approve their timecards. In addition to the improved mobile app, the new release of uAttend also features a Dashboard homepage that allows administrators to view productivity charts, a Punch Management screen that contains information for all methods of employee punching, and much more. Access the records from anywhere, password protected. uAttend Fees are TAX DEDUCTABLE. Ask your CPA, they will confirm. uAttend additional fees: Certain uAttend features incur nominal additional fees. and security codes and unique administrative rights, are $6.00/month per administrator. Exports to any format other than ProcessingPoint or CSV are an additional $5 per month. ADP, CSV, Excel, MAS90, Paychex, QuickBooks, and more. This is how you get started: Follow the prompts, it is very clear, or call for technical support. Unlimited Departments - Separate and segment employees any way you like! released, they are automatically added to the your system!